Usually when a pizza craving hits, I take out a fine pie from Village Pizzeria, or indulge in the gourmet styling of Mozza’s thin-crust beauties. PIZZA CRUSTS at Olio are fashionably thin and crispy, yet chewy. 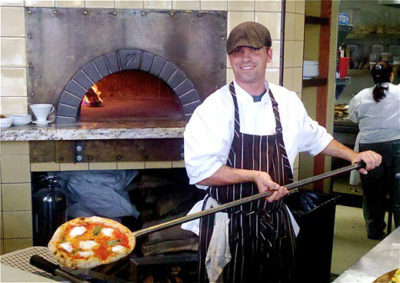 stools at the counter in front of the blazing wood-fired oven proved a perfect spot to appreciate the controlled frenzy that is pizza preparation. It’s a wonder the two cooks didn’t knock each other senseless with their long-handled pizza paddles competing for space. We started with a refreshing Caesar salad and terrific fire-roasted cauliflower. The accompanying dollop of curry sauce was secondary to the flavor of the nicely charred florets. With a couple of appetizers, one pizza is big enough to split. But we were greedy and ordered two: the classic Margherita with fresh local mozzarella and their new spicy sausage and pepper pizza with carmelized onion sauce, and two kinds of spicy peppers. Both were delicious. Crusts were fashionably thin and crispy, yet chewy. Olio means “oil” in Italian, but in English its definition is “mixture,” and Olio will definitely join the mix of pizza places we haunt when the hunger strikes. Starters are under $10, salads range from $7 to $13, pizzas run $12 to $17. Wine and beer. Olio Pizzeria & Cafe. 8075 W. Third St. #100, 323-930-9490. Open 11 a.m. to 10 p.m. daily. 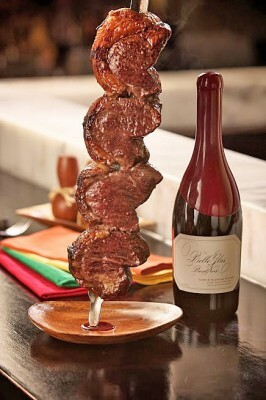 When cheesy goodness isn’t what the beast within demands and nothing short of a meat feast will do, what better place to indulge than M Grill, our neighborhood Brazilian Churrascaria (steakhouse)? Recently expanded and renovated, the interior is sleek and warm, featuring a glowing translucent marble bar, walls of rough-hewn stacked stone, built-in glass wine displays, and large windows overlooking busy Wilshire Blvd. We started with a caipirinha, a Brazilian mojito, and a complimentary basket of delicious cheese bread. IT’S ALL ABOUT meat at M Grill. There are two dinner options: the extensive salad and hot buffet bar alone, or combined with an endless supply of barbecued meats. It’s easy enough to be satisfied with the kale salad, roasted vegetables, smoked salmon, seafood stew and the rest of the 35 or so items offered at the buffet bar, but that would be missing the point—the 16 simply grilled meats that are offered in rotation throughout the evening. We were given cards to signal when we were ready for more or needed to slow down, but we totally ignored them and soon our plates were heaped with filet mignon, ribeye, pork ribs, rack of lamb, smoked sausage, and my two favorites —the seasoned specialty cut, picanha, and the garlic chicken. Some of the offerings erred on the salty side, but all were of excellent quality and delicious. The terrific wait staff was efficient and friendly. Lunch salad bar $22.99, with 11 grilled items $28.99. Dinner salad bar $28.99, with 16 meats, $46.99. Full bar. M Grill. 3832 Wilshire Blvd. #202 (second floor). 213-389-2770. Lunch and dinner daily. Free parking..